- The world's largest retailer (Amazon) doesn’t own a single store. - The world's largest provider of sleeping rooms (Airbnb) doesn’t own a single hotel. - The world's largest provider of transportation (Uber) doesn’t own a single car. - The world's biggest media owner (Facebook) creates no content. - The world's most valuable retailer (Alibaba) has no inventory. The above are evidence of 'The Sharing Economy' which is a key component of the new world of work. At the heart of this new world is shared-value. 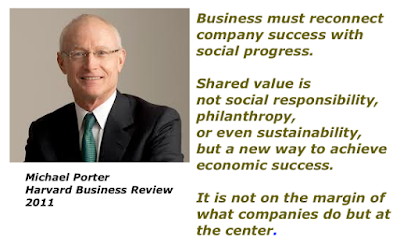 I was thrilled when I first read Porter's comment 5 years ago because the idea of shared-value has long been at the heart of my work with my clients and the fundamentals, as I have come to see them, of all remarkable businesses as illustrated below. …the future face of capitalism, say authors John Gerzema and Michael D’Antonio in their book Spend Shift will be defined by delivering value and values. We have all seen values displayed on walls and written in annual reports. The failure to live what is said and written is one of the biggest reasons for poor levels of employee and customer engagement, and so defining our values is not just about words, rather it is about defining the actual behaviours, living by them and being accountable. In my experience when agreed behaviours are measured as part of performance leadership systems not only does greater accountability occur, the corresponding increases in engagement and therefore productivity, mean profound changes in the delivery of value to stakeholders. None of this happens unless employees feel valued. In the context of employees feeling valued, living values, delivering value, and sharing and creating shared value, I'll be producing a short and succinct video (less than 5 minutes) every Monday morning in 2016. Then I'll be conducting a People, Process, and Profit Monthly Intensive via web TV that will expand on the videos through candid and convivial conversations based on your questions and input. Through these conversations we'll be co-creating something better together for our personal and business lives. The above will be complimentary and exclusive to those who register which you can do here. 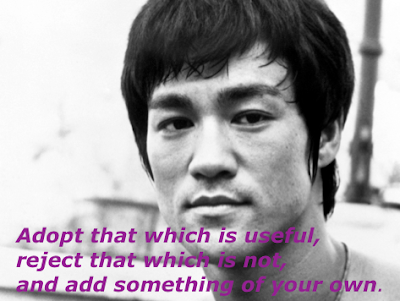 All will be in the spirt of the following insights attributed to Bruce Lee, and wisdom from one of the great pioneers of leadership development Mary Parker Follett. I look forward to you joining me on the journey in 2016.